“We have a lot of employees,” says Bryan Spangle, co-owner of Organic Solution. Not many businesses only in their third year could make such a boast, but in this case his claim is justified. Organic Solution has millions of employees, all working around the clock to create the product. Those employees just happen to be worms. “George and I are on a mission from God,” jokes Spangle. At first the duo thought they would get into organic composting, but after talking with the organic farmers in their area, they realized the real demand was for organic worm castings. Organic Solution sits 30 miles outside of Los Angeles. This boutique operation creates worm castings in three ways. The first is through windrows, which are long piles of organic material.The organic material is composed of use horse manure from a local ranch that forgoes antibiotics and GMO feed, paper scraps, and locally sourced vegetable waste. The material is slowly added a few inches at a time as the worms eat through it and breed. 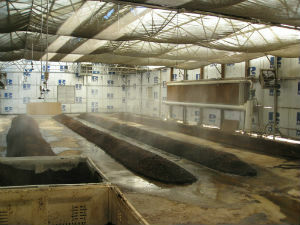 A second method operates with a flow-through bio-reactor, which is a metal box open at the top where the feed is added to the worm-organic material mix, with a screen on the bottom to harvest the castings. A third method is for African night crawlers, which live in five-gallon containers. They are rotated every two weeks and are fed a special diet. With all of these methods, the castings need to be separated from the feed. That material is worth the labor, according to Spangle. Although the hummus-like castings collected in this method can then be sold, Spangle and Keossaian go a step further and run some of the castings through a high-power water jet to extract the “goodies,” as Spangle calls it, from the casting material. The solid material is returned to feed the worms, and the goodies go on to create a liquid form of worm casting that they call Ambrosia. Ambrosia has a long shelf life and can easily be added to gardens. Organic Solutions also combines the castings and Ambrosia to create another product called VermaChar, which is half worm castings and half biochar. Biochar is a natural soil amendment, created by burning organic material. Biochar will last for centuries in the field. In its raw form, biochar will initially rob a soil of nutrients, so it needs to be “inoculated,” or charged with nutrients, before it can be added to the soil. To make VermaChar, biochar is soaked in Ambrosia then mixed with castings and cured. Since these products are all sold through Organic Solution’s website, in theory this means they could sell anywhere, However, Spangle and Keossaian believe their industry should be very localized, with customers within a 200-mile radius. Their products are heavy, and selling to customers farther out means the shipping costs may be as much as the product itself. “It’s a tough sell,” concedes Spangle. They think this is fine for now, though, since LA provides them with a very large customer base of organic commercial farmers, medical marijuana producers, organic home farmers and organic landscape providers. In the future, they would like to get their LA operation profitable and grow it, and then potentially establish satellite farms elsewhere in California, Oregon, and Washington.